It goes without saying that Tintin, that intrepid Belgian junior reporter, doesn't exactly have Americans lined up in the theaters. That's simply because Tintin is a European creation and a European fixation (a bit like Jerry Lewis is to the French). It also goes with saying that The Adventures of Tintin wouldn't have anyone lined up for it save for a few details: the director is Steven Spielberg, the film is said director's first animated/motion-capture film, and the film is said director's first foray into that world called 3-D.
My loathing for almost all 3-D films is ever-flowing, but because it is Spielberg, I opted to go see The Adventures of Tintin in 3-D. So far, tragically, my views on 3-D still hold: I found nothing in the 3-D Tintin that I couldn't have enjoyed in 2-D; why people enjoy paying more to have things thrown in their face I'll never understand. Perhaps if I had seen Tintin in 2-D, I might have enjoyed it more, but that is highly unlikely. 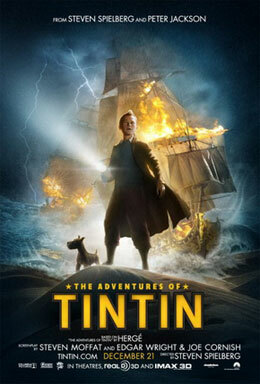 Tintin (Jamie Bell), our intrepid junior Belgian reporter by way of London, almost immediately comes to a new adventure. He's bought a boat: a beautiful model of a lost ship, The Unicorn, and instantly two people wish to buy it from him. One of this is Sakharine (Daniel Craig), a villain if ever there was one. It is very soon that Tintin discovers that this model ship is one of two, later three, all which contain a set of clues to a long-lost pirate treasure. Unfortunately, Sakharine knows this too, which is why he and his henchmen attempt to kill Tintin and later kidnap him to find the second scroll. I'd like to note at this juncture that this is being sold as a kid's movie, what with all the murder and kidnapping and beating up going on. Tintin is being held on a ship where the captain is also being held prisoner. The captain needs to be kept alive because said captain is Captain Haddock (Andy Serkis), a direct descendant of Sir Francis Haddock and as is always the case, the last of his line. Haddock is the only person who can interpret the clues in the scrolls hidden within the two (later three) model Unicorns. He's a bit of a drunkard, but the captain and Tintin manage a daring escape. The third model is in Morocco. Off to Morocco they go, with Sakharine getting there first. Eventually, their paths cross in an emir's palace and in a wild chase. Sakharine now has all three scrolls. Never fear, though, it is Tintin after all. They are recovered thanks to Tintin's police friends, the duo of Thomson and Thompson (Nick Frost and Simon Pegg), the treasure discovered...and a hint of more treasure out there. Yes, dear friends, The Adventures of Tintin ends with a suggestion that this will be merely the first part of more Tintin films. Longtime readers should know about one of my Golden Rules of Filmmaking: Never End Your Movie By Suggesting There Will Be A Sequel. It isn't a strict surprise that The Adventures of Tintin is the beginning of a hoped-for Tintin franchise: for the longest time the film was called The Adventures of Tintin: The Secret of the Unicorn, and any film that has a colon and subtitle all but tells you, 'we're going to make more, whether you want to see more or not. However, given that in recent weeks the subtitle had been dropped from all adverts it is surprising that people are being shepherded to pay more for a very long trailer. The adaptation of Hergé's creation comes from Edgar Wright, Joe Cornish, and Stephen Moffat (the latter best known as the writer and executive producer of the long-running British science-fiction program River Song, formerly known as Doctor Who). What I found in the story to be extremely troubling were both length and pace. As a side note, I'm going to guess that the 'last of his kind' bit came from Moffat, who uses that trope repeatedly on Doctor Who. We have the main story of the search for the 'secret of the unicorn', but a great deal of time was taken by the search for a pickpocket running through the streets of Brussels/London. I suppose this was a way to have our Dunce Duo of Thomson and Thompson pop up (and in fairness, the pickpocket had stolen Tintin's wallet which contained the scroll from his Unicorn model), but it only felt like it was making 107-minute long film even longer. For us who have never read a Tintin story, and I imagine that would be a majority of Americans, there simply had to be a better way to get these characters into the story. Moreover, we never really got a sense that Tintin was this intrepid Belgian reporter because we never got a sense he was either intrepid or Belgian. He almost appears to just be wandering into the mystery without any idea of what is going on. What other 'intrepid' reporter would not be at least curious as to why all these shifty characters were after his treasure boat? While the character of Tintin is suppose to be Belgian, he appears to be thoroughly British in his voice. Given it's Billy Elliot, that can't be helped. Whether it was because the actors are British (Bell, Craig, Frost, Pegg, Serkis) I can only guess, but there's no suggestion that this is a Continental adventure, let alone Continental characters. Somehow, the actual character of Tintin appeared as opaque as his rubbery face. I never found anything in him that was smart or clever, more annoying and almost slightly hysterical. Maybe it was because a lot of time was also spent on giving exposition dialogue, especially of things we'd already seen, so it is annoying when the characters have to stop so as to fill in others in the story of what we the audience already know. How it is possible for moody, morose Daniel Craig to appear so flat and morose in an animated film I'll never figure out. He was a cliched villain: all nasty sneers and thrusting his cane out at us. While we should continue to marvel how Andy Serkis is now the go-to man for motion-capture acting, his Captain Haddock wasn't funny (as when he belches fuel into a plane) and wasn't quite as sympathetic (playing getting sober for laughs isn't exactly what I think is good for a kid's film). Pegg and Frost I hope had fun, but even when we go to them at the capture of the pickpocket (complete with birds floating around the kleptomaniac's head), none of it is funny (and I think the joke went over the audience that I was watching it with. I got it, but didn't laugh). Allow me a slight digression. 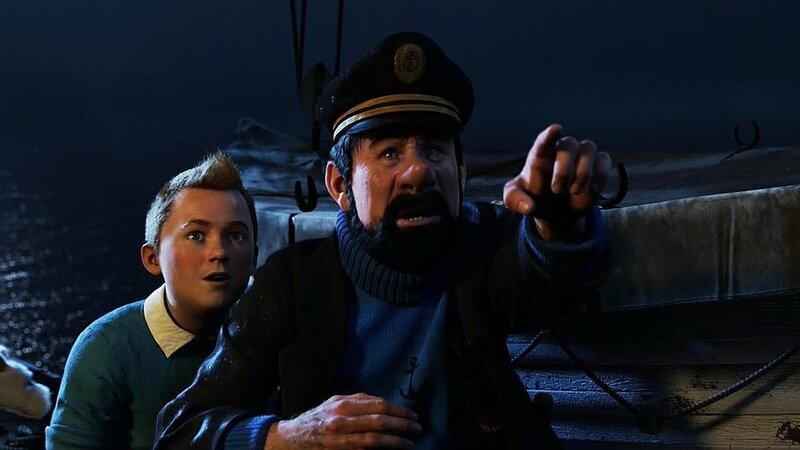 In The Adventures of Tintin (formely known as The Adventures of Tintin: The Secret of the Unicorn), Captain Haddock is the direct descendant of Sir Francis Haddock, and the pirate who tried to take his ship, one Red Rackman, has a descendant of his own. One guess as to who said descendant could be. That makes me think that somewhere Red Rackman must have had a son lying around somewhere, otherwise the plot would make no sense. It's never a good sign when your mind starts wandering away from the main story in order to fill in unnecessary details. Perhaps my biggest complaint against Tintin is his tin-tin ear to how he's being sold. This is being pushed as either a film for kids or geared towards families. However, I would be highly distressed to take my child to a film where our young hero (it never appears to truly settle on whether our junior reporter is a child or a teenage) is shot at several times (with a body in front of him in one point), abducted, beat up and beat about the head a lot. A child wouldn't be able to handle a gun so well, but he doesn't look like a teenager. This isn't to say there aren't good things in Tintin. The chase sequence in Morocco was a good thrill though again, I found little to nothing in 3-D to add to the pleasure of that set piece. The opening John Williams music was fun, a light, jaunty motif that led me to think the film would be fun. You don't go wrong with Williams, but you can have too much of a good thing. I wrote, "Someone stop the music" early in the film. Tintin appears to drown in music, and it was becoming far too much of a distraction for me. I will credit the motion-capture animation as looking better than in the past (example, A Christmas Carol), and in the Morocco sequence, from afar it almost looked lifelike. However, it still looks animated, and one wonders whether it will ever get to the point where it will look totally human. 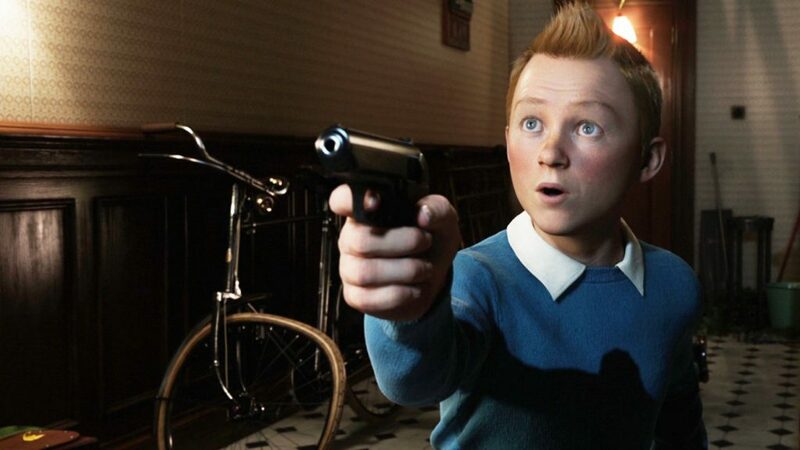 Again, I could have let The Adventures of Tintin pass as mild entertainment if it weren't for the declaration that we need or want more Tintin in our lives. That is always the point of no return for me, the part where the film is pushed down. Alas, for me it's ta-ta to Tintin.